1 Port RS422/RS485 PCI Express Card provides electrical protection for your serial devices. 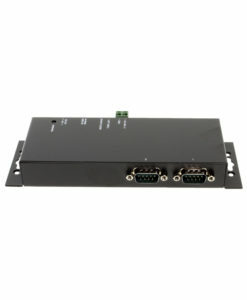 It maintains a scalable, high-speed serial I/O bus interface. Supports low profile form factor and DB9 male connector. Maintains a scalable, high-speed serial I/O bus interface that is backward compatibility with current PCI applications and drivers. Features its plug-and-play utility, installs without conflict. 128-byte deep FIFO per transmitter and receivers. Auto RS485 Transmitter buffer direction control by the ATTATM Hardware. Guarantee Fast Turn Around the Transceiver. The SG-PCIE1S422485IS PCI Express provides electrical protection for your serial devices. It maintains a scalable, high-speed serial I/O bus interface that is backward compatibility with current PCI applications and drivers. It has an architecture defining high-performance and a point-to-point serial bus at speeds of 250Mbytes/sec to 4GBytes/sec. The SG-PCIE1S422485IS is compatible with new and legacy RS422/485 devices. It is easy to install and use with its plug-and-play feature. It includes the functional scalability to quickly adapt to new emerging serial technologies to grow with your application requirements. With the PCI Express Plug-and-Play feature and drivers, simply follow the instructions of the Install Wizard to complete your new serial interface. We’ve eliminated the need for configuration of I/O address, IRQ jumpers, DMA and others when you are connecting the serial devices. Your system will recognize the device and install the drivers automatically. The SG-PCIE1S422485IS PCI Express card is an ideal solution for your expanding applications.